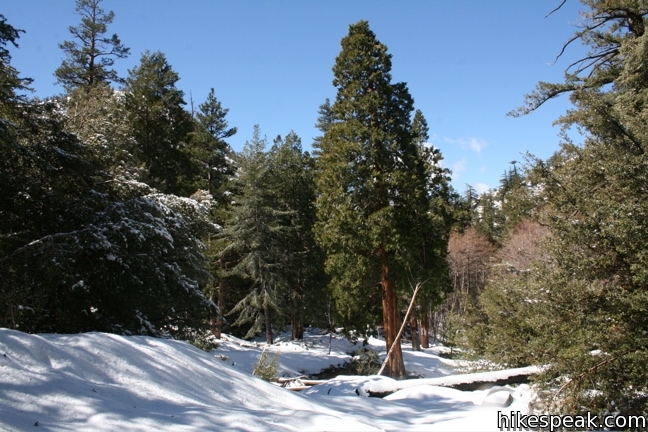 Icehouse Canyon is located in a beautiful stretch of the Angeles National Forest near Mount Baldy Village, just southeast of the mighty Mount Baldy. 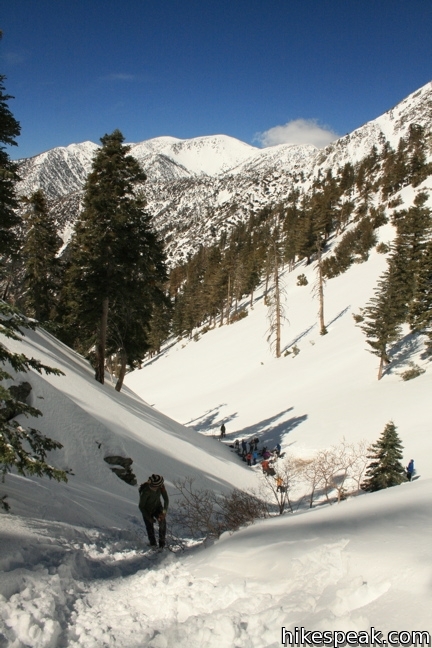 A trail through the canyon leads up to Icehouse Saddle. 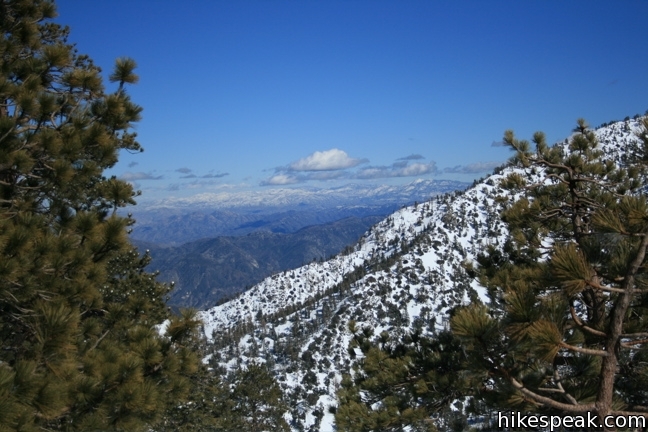 At 7,500 feet, this low point in the ridgeline offers sweeping views of the western San Gabriel Mountains. 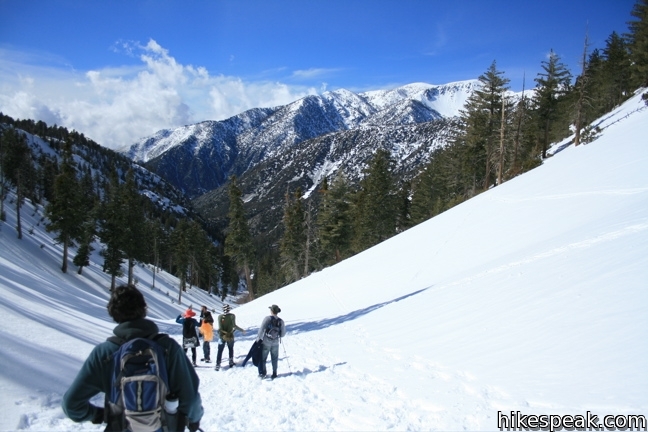 From the saddle, hikers and backpackers may continue on in several directions to explore nearby peaks and venture deeper into the Cucamonga Wilderness. 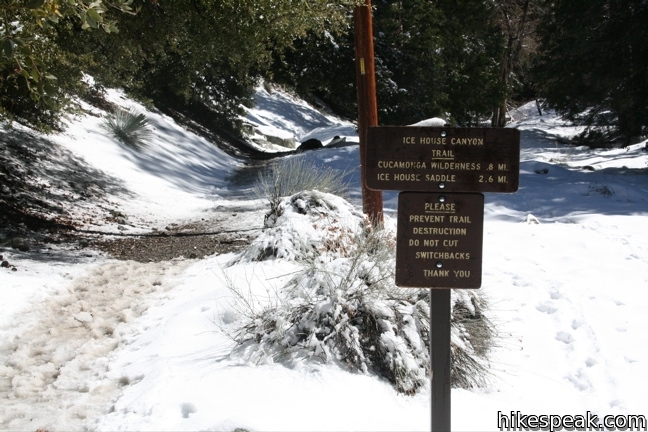 The single-track to Icehouse Saddle climbs 2,600 feet over 3.6 miles and is an exceptional hike. Departing from the parking lot along Icehouse Canyon Road, the trail takes course along the northern bank of a creek that flows down the canyon. Crystal clear water tumbles past oaks and sycamores, and this is a fine venue for a directionless romp through nature for those disinterested in following the trail. 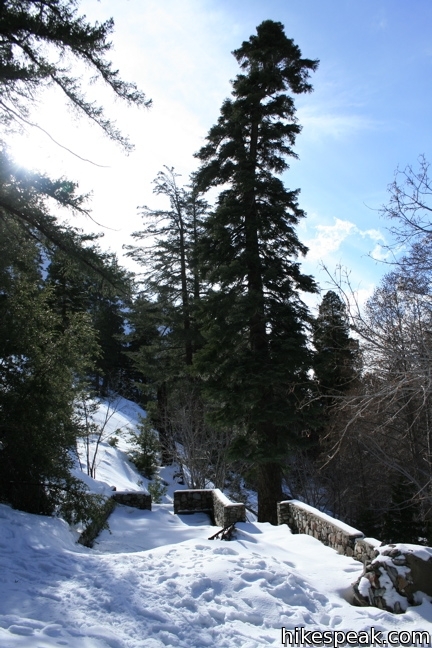 A half-dozen cabins are spread out along the bottom of the canyon, along with another half-dozen stone foundations (ruins left over from the early days of the Angeles). The trail passes these current and past dwellings, ascending gradually into a wilderness with less and less human impact. 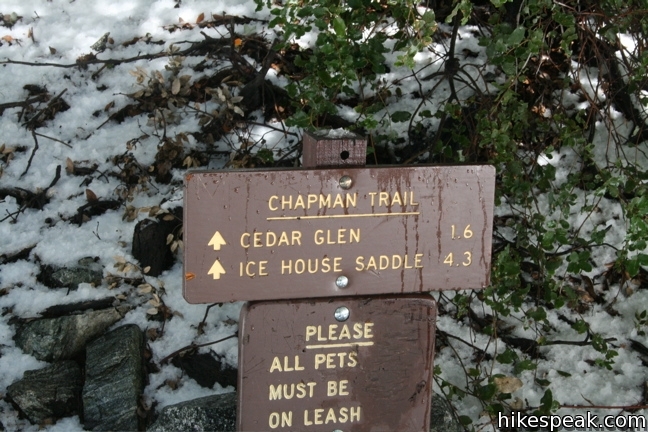 One mile from the start, comes a junction with the Chapman Trail, which turns north, passing through Cedar Grove Trail Camp on a more roundabout course to Icehouse Saddle. 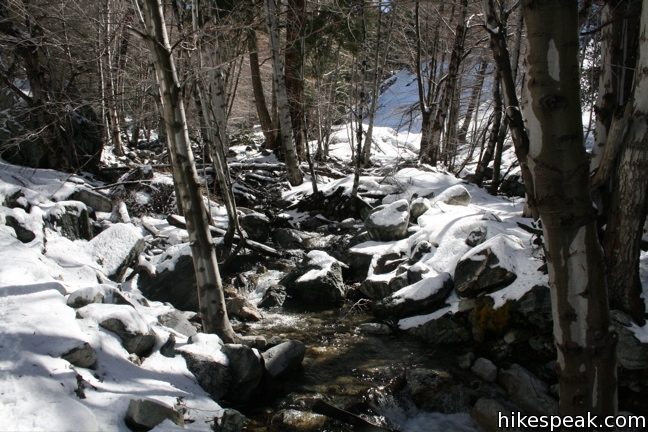 The Icehouse Canyon Trail continues straight ahead, eventually crossing over to the south side of the creek. 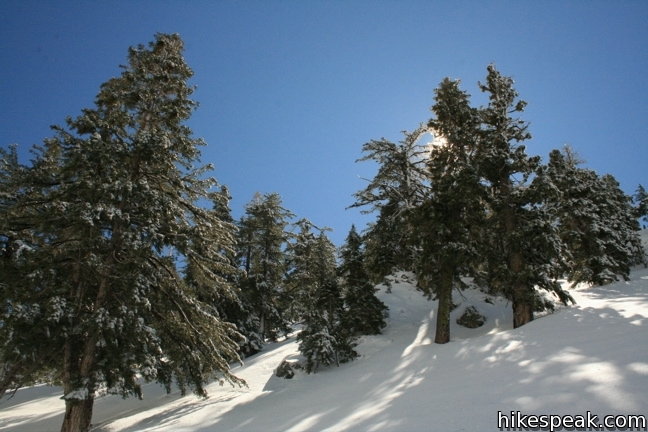 Incense Cedars and firs become the dominant arbors, and 0.8 miles past the junction, the trail crosses a sign marking the boundary of the Cucamonga Wilderness. This is the halfway point by mileage, but in some ways, the hike is just beginning. 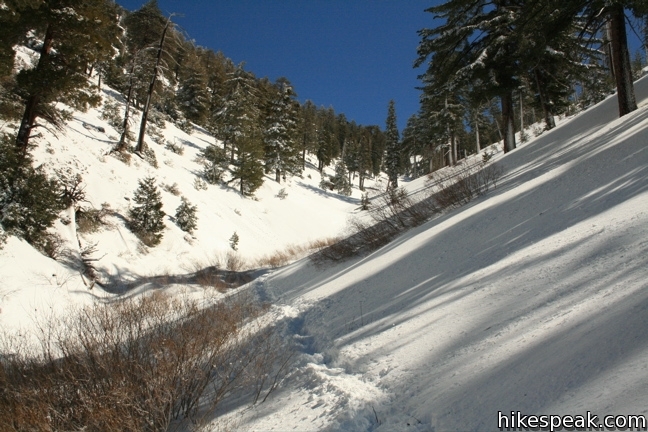 Winter trail conditions: Snowfall can cover the entire landscape with a thick white blanket. The path over the snow should be well-packed, firm, and easy to cross, but be careful; if you step in the wrong place, you could find yourself in snow up to your thigh. 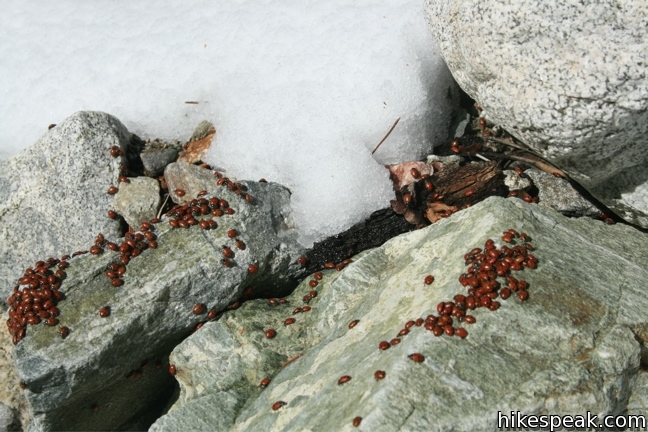 For this reason, many hikers wear snowshoes and crampons during the winter months, but the trail is still manageable in boots. 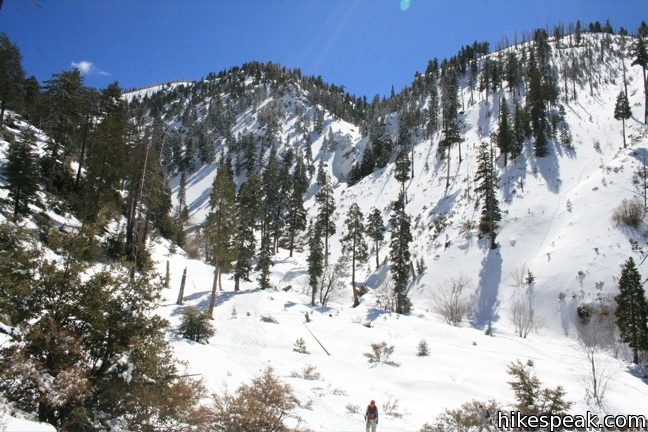 Normally, the trail crosses to the north side of the canyon and climbs a series of switchbacks to get to Icehouse Saddle. However, when that white thing that is usually foreign to Southern California covers the ground, the consensus becomes to take a direct track right up the center of the canyon. 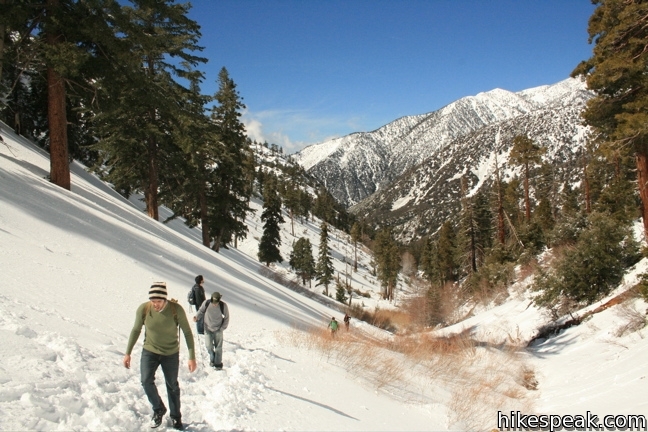 Not long after crossing into the Cucamonga Wilderness, the trail begins to climb more seriously. Your heart starts to pound and your thighs start to burn… and then you hit the real steep section, an arduous march up a slippery slope called “the waterfall.” Have a look around for inspiration. 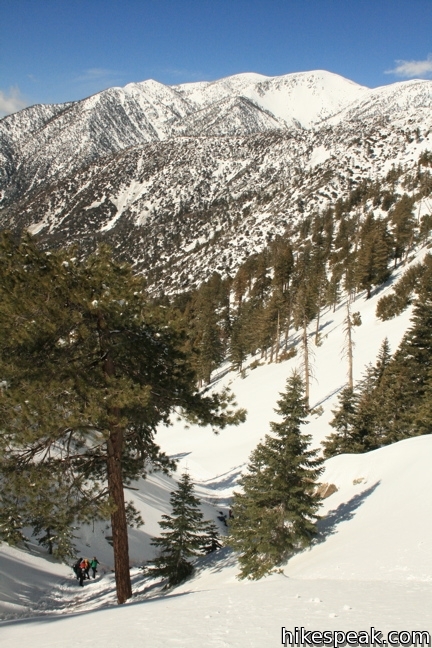 The views of Mount Baldy are as good as they come. 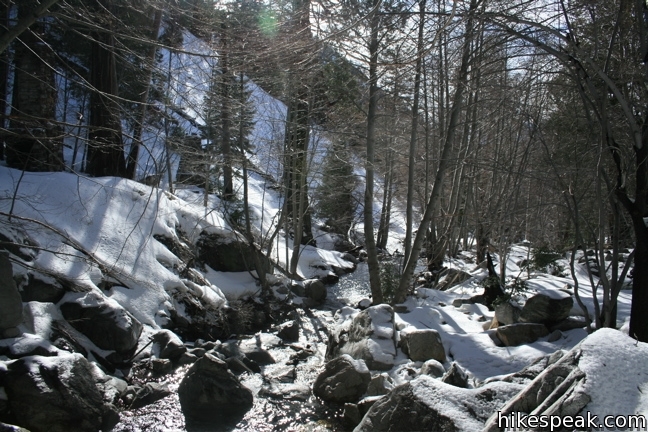 Above the snow-covered waterfall, the trail becomes more generous again and there is only one more steep passage over the last third-mile. 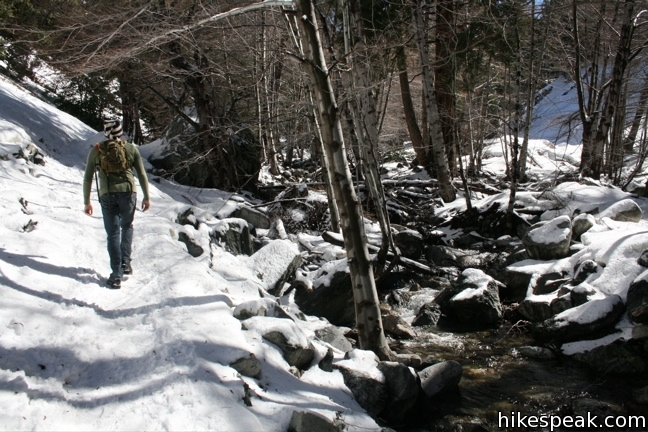 Hikers may turn around at the saddle or continue on in four different directions. These tracks are barely visible under the deep snow, and only one trail sign is visible. To the north a trail follows the ridge to Timber Mountain (0.9 miles), Telegraph Peak (2.9 miles), and Thunder Mountain (3.9 miles), before descending to Baldy Notch (5.4 miles). 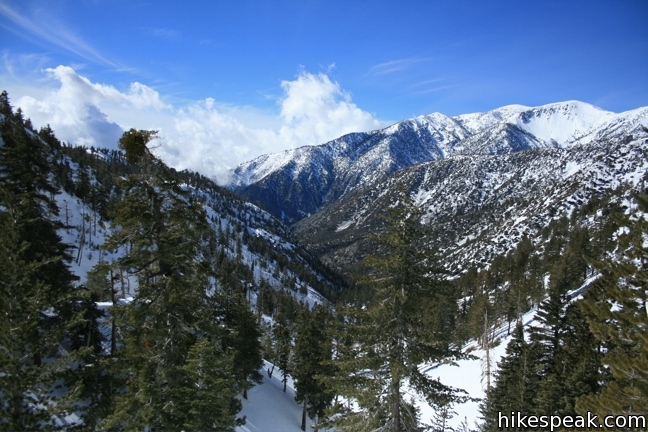 To the southeast is a trail to Cucamonga Peak (2.4 miles). 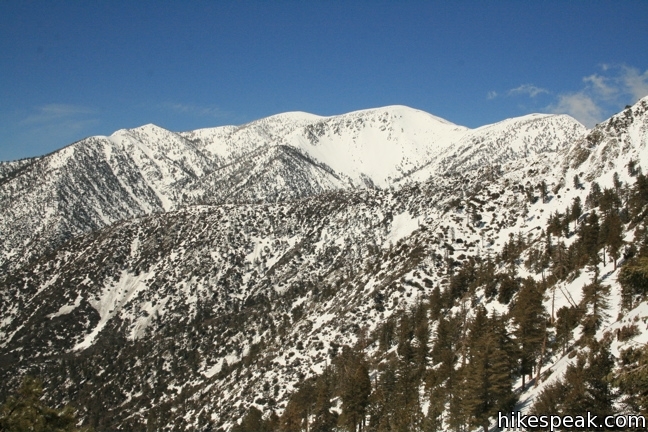 To the southwest is Ontario Peak (2.8 miles). 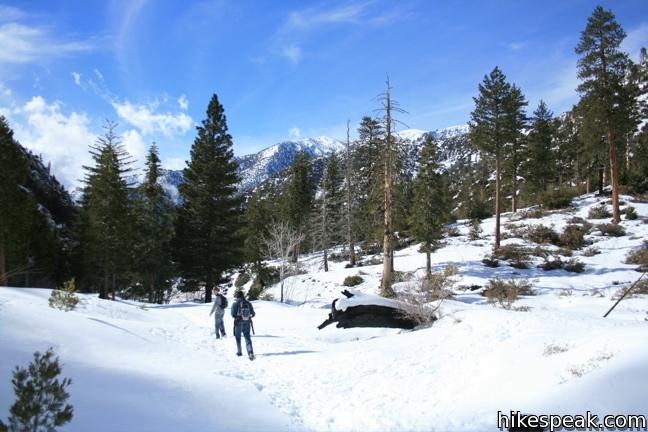 And to the east, the Middle Fork Trail descends 5.4 miles to Middle Fork Trailhead. 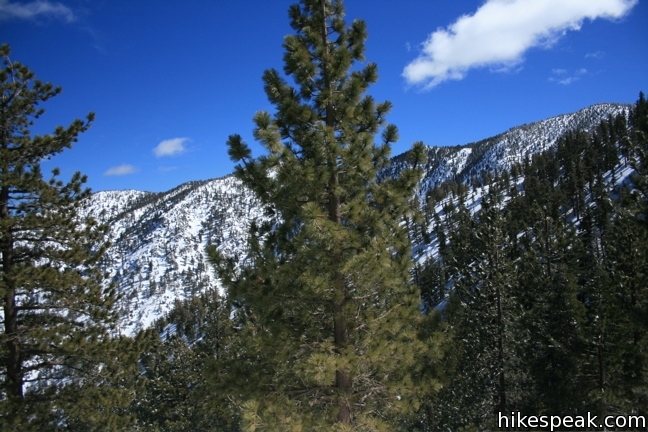 If Icehouse Saddle is your final destination, it is worth the extra effort to hike up the ridge to the north a few hundred feet to get above the trees for a magnificent view of the range to the east and west. 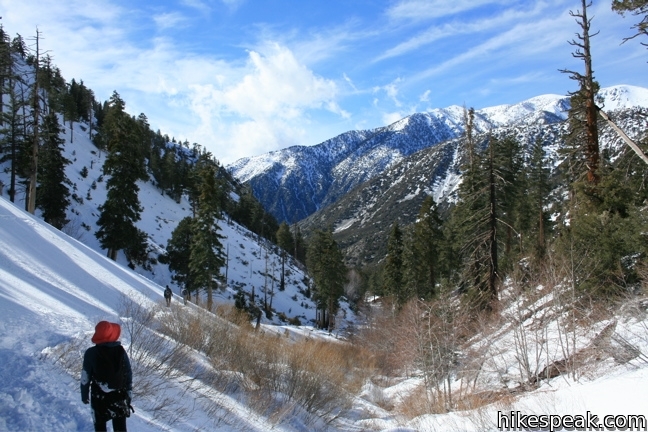 The combination of blue skies, white snow, and impressive peaks make for an exception outing. 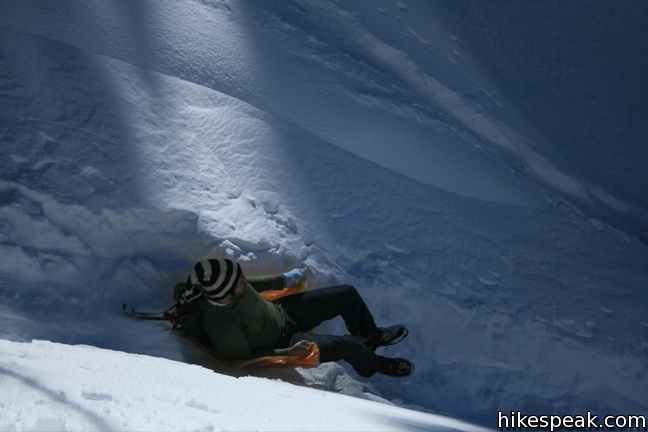 On the descent, if you keep an emergency poncho in the bottom of your backpack (for completely different circumstances), you can put it to use as a makeshift toboggan. 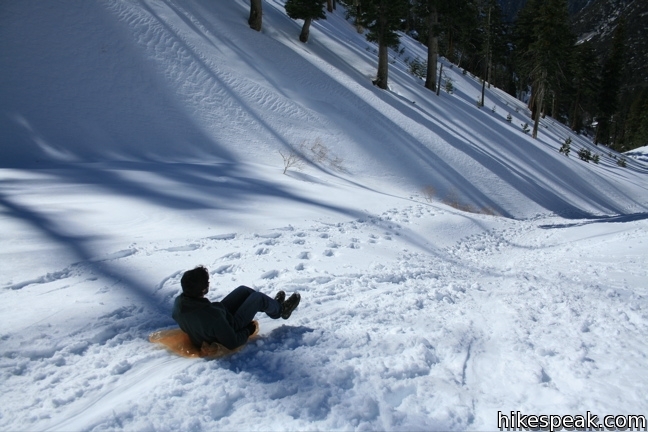 Poncho sledding, as it could be called, adds even more enjoyment to this winter hike. 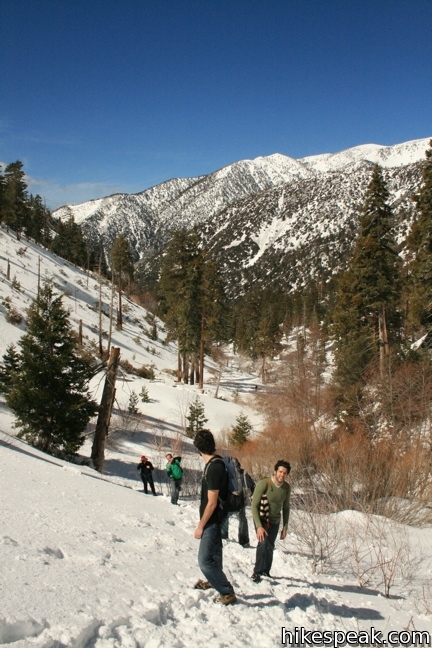 Before you go: In addition to an adventure pass, a free wilderness permit is required to enter the Cucamonga Wilderness. 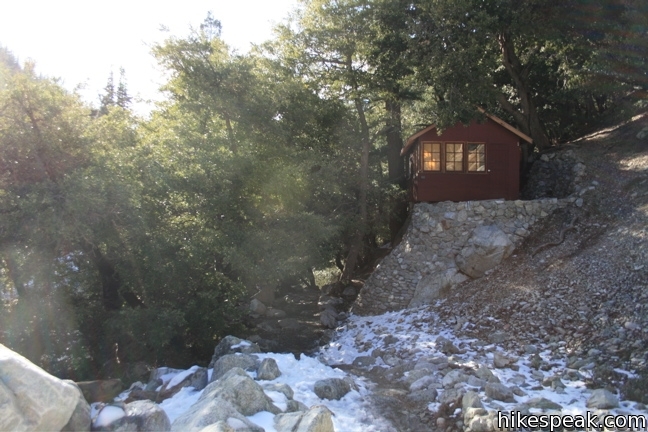 The permit may be picked up at the ranger station in Mount Baldy Village the day of the hike, or call ahead if you’re a sunrise hiker and they will leave it out for you. 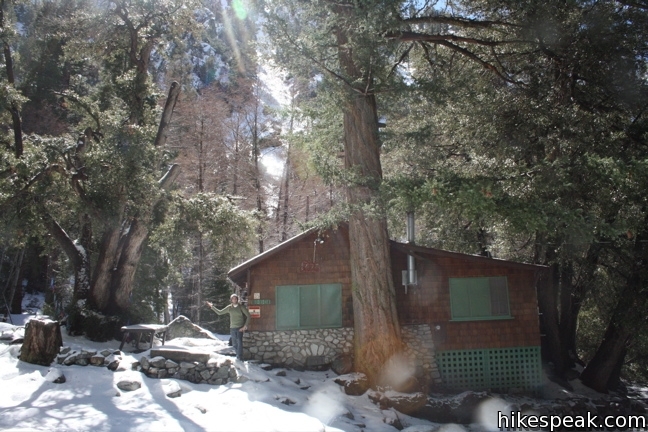 In addition to the trail camps, backpackers may set up camp anywhere they wish in the wilderness as long as the spot is 200 feet from creeks and lakes. To get to the trailhead: Take the 210 east and exit on Baseline Road (exit 52). Turn left at the light at the end of the ramp on to Baseline Road. Make the next right on to Padua Avenue. 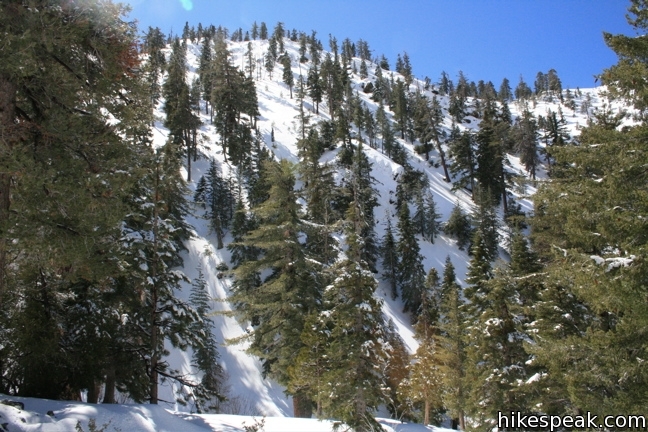 Drive 1.7 miles and turn right onto Mount Baldy Road. 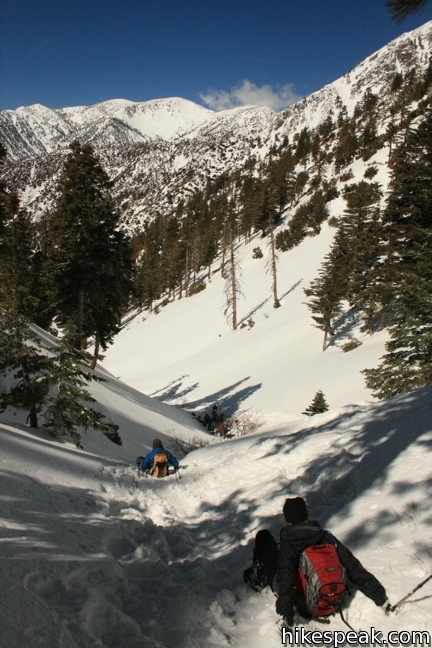 Pass through Mount Baldy Village and pick up a permit at the ranger station. 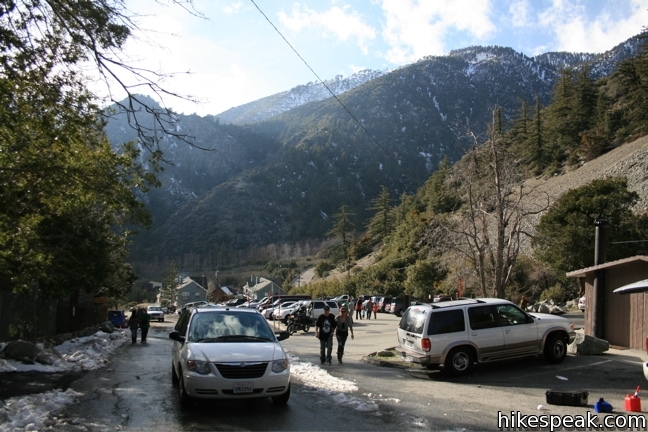 One and a half miles later, turn right on Icehouse Canyon Road and pull into the trailhead parking lot on the left side of the road. These photos were taken in February of 2010. Click to Enlarge. 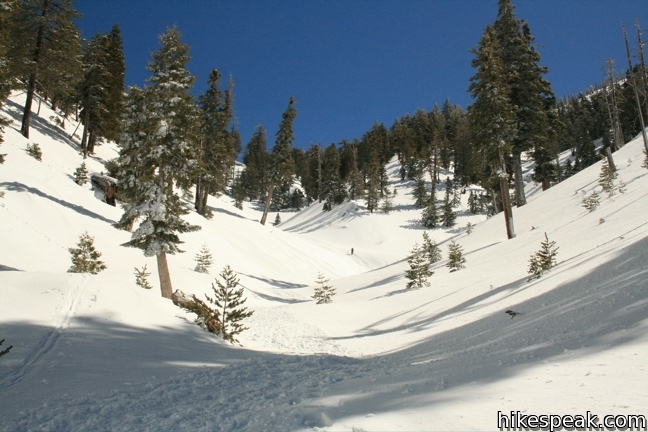 Baldy Bowl - Ski Hut Trail offers a steep but scenic ascent up the south side of Mount Baldy, crossing 4.5 miles and 3900 feet to the summit. I will be in the Irvine area for the first time for the next couple of weeks coming from NC. Can someone let me know what to expect in terms of snow on the trails in this area? 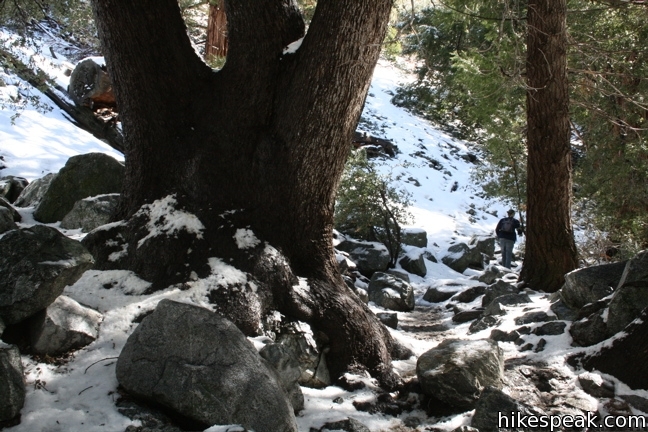 I hiked this trail on 2/15, no snow Great hike! I lived one mile up this trail when I was 2 yrs old , we had to hike up and back every time we went to church , store etc. I was not carried as there were younger ones than myself .I have been hiking ever since . I went back once when I was a teenager and would love to do so again . I recently looked at some photos of the place when I lived there . We took baths outdoors in a large tin tub. What a simple beautiful life ! Thanks Daddy and Mommy ! I use to live 0.8 miles up this trail. For the most part it was great but there was this family a little bit up the trail from our place and they were constantly running a pack of tiny children up and down the trail. The noise was unbearable. The weirdest part is that they were always dunking their kids in a rusty old tub outside the cabin. I just don’t understand some people. Thanks, neighbors! Wow what beautiful snow pictures! I’ve been up here in the fall & it’s wonderful, with the Big-Leaf Maples changing color… but didn’t realize how awesome it’d be in the winter. Thanks, gotta make a trip up. I bet the trail is great in the fall. It’s nice in the spring too when you can cool off with a dip in the creek. 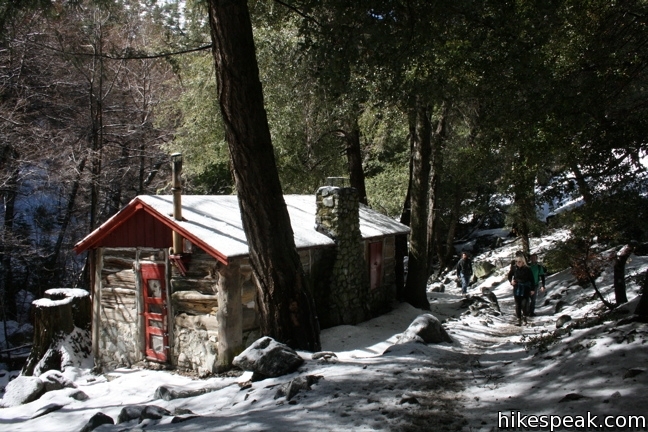 I’m going up to Kelly Camp this Saturday, 11/24/12, with some Boy Scouts. Anybody know if there’s any snow on the trail? The weather is warming up this weekend, and will be practically balmy, but I don’t know about the upper elevations. Either way, should be fun. 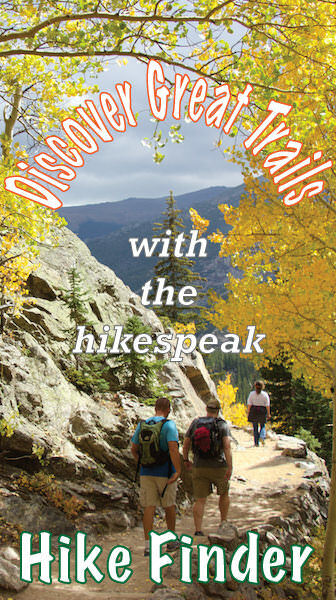 The best hiking trail around; captures amazing beauty. 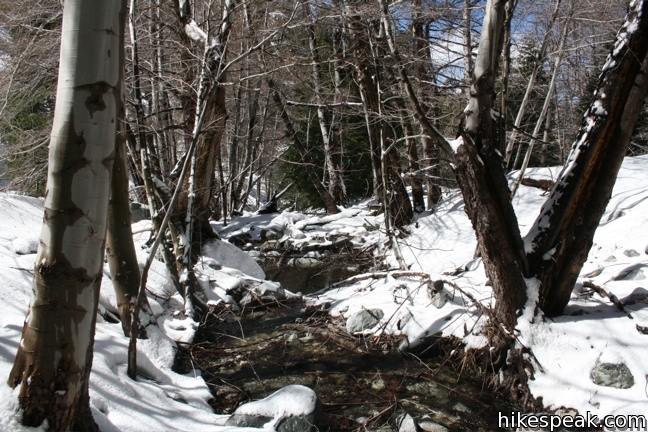 I enjoy hiking this trail and others in the area on a weekly basis when possible. Where would you recommend camping at the base of the mountain? Are there any campgrounds with running water? I will be taking this trail on this sunday with a couple of friends! we are eager to test our skills and broaden our horizon! I’m planning on hiking this on Saturday. 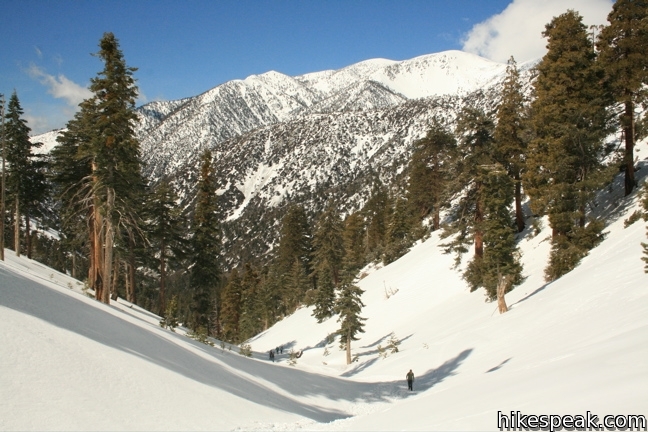 Is there still snow going up to Cucamonga peak? Do I need microspikes? Thanks! 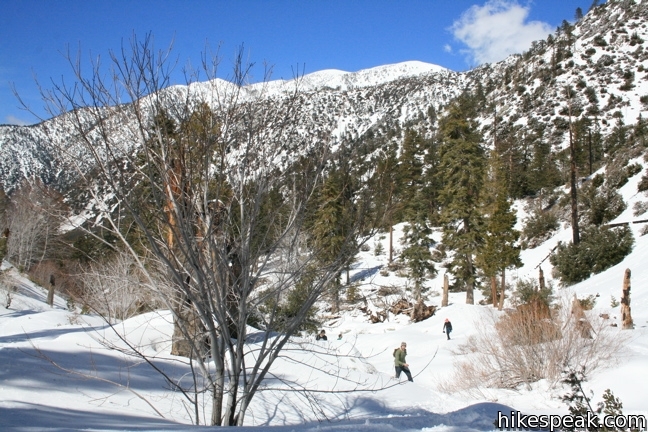 We are backpacking along this trail in a few weeks. Does anyone know if there is water in the creek or at Cedar Glen Campground? Thanks for any help. 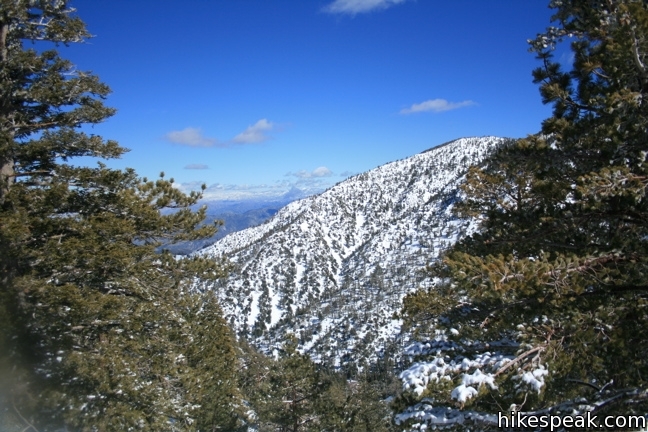 I’m planning a hike on Dec. 26 — was wondering if there is snow on ground now and if one needs to wear boots? thanks! How is the snow right now, this weekend (Jan 16th, 2016) ? Looking for sledding and snow play. Just got back home from doing this! It was beautiful just like you said. Wish I could have tobogganed down haha. Thank you for the in depth guide! 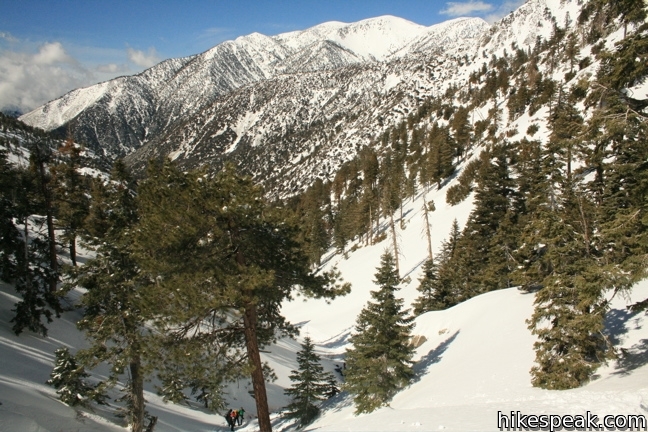 How are the conditions for snowshoeing in Icehouse Canyon this year? 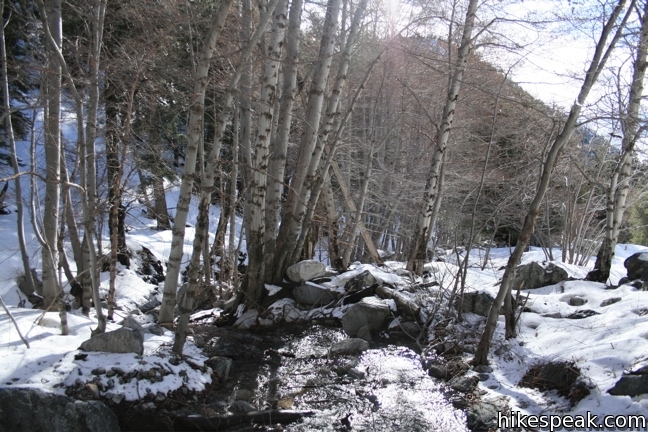 The snow is melting so fast in Big Bear. Hi, Am planning on doing this tomorrow, Fri, 7/1/16 and wondered if the crowds are any less during the week. Planning to arrive at the parking area around 6AM. Absolutely. You should not have any problem finding open parking and solitude on the trail. Enjoy the hike!